Are the consumer products in your home safe to use and store? It’s all relative— and I can help you find out. Are you and your loved ones unknowingly exposed to harmful chemicals? So many homes, including plenty of “green” homes, are still full of harmful and polluting chemicals. These chemicals are found in consumer products like cleaners, pesticides, synthetic fragrances, certain personal care products, and more. No wonder. Who has time to research which products are really safe? Well, I’m part of the healthy home industry. So I take the time to research household products for myself, my family, and my customers. And love sharing my best discoveries! I can help you with the following, and refer you to other experts as needed. Identifying any hidden toxic hazards. Trying least-toxic alternatives gradually. As examples, here are cleaners I commonly use. Setting up a system for ordering online, for you or your shopping assistant to use. 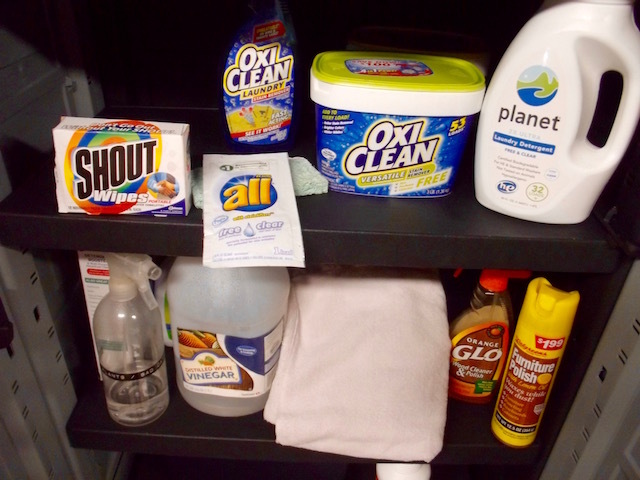 Using and storing any remaining toxics safely. Or as safely as possible. Safely disposing of unnecessarily hazardous products. If you’re a new customer, starting after October 2016, you’re already on board! Helping you transition to least-toxic products is built right into my service now. If you started my service before October 2016, I can still help you transition to least-toxic products, as an optional add-on service.